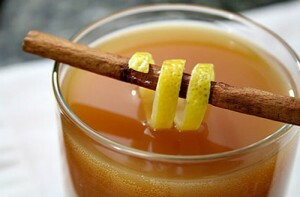 Hot mulled cider with a splash of spiced rum, served with a cinnamon stick and lemon peel! An after dinner drink that’s perfect for the holiday season! In a large pot or slow cooker, add all ingredients except for the alcohol and garnishing items. Cook on low for at least 30 minutes before serving.